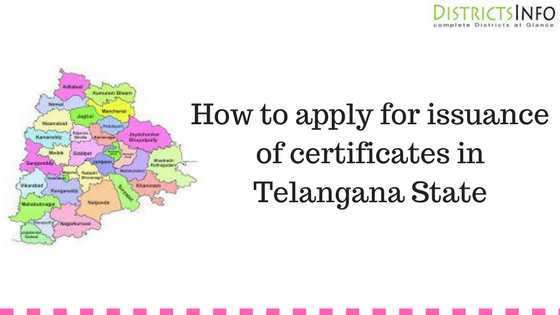 How to apply for issuance of certificates in Telangana: Police department also provides the facility of issuance of different types of a certificate in Districts of Telangana State. Any citizen can request for issuance of a certificate to there police department. The different types of the certificate such as character certificate of a person it contains behavioral details of a person, antecedent certificate, job verification certificate, NOC for vehicle transfer. meeseva provides the service of issuing certificates from the police department. After this, click on the department of police. Download the application form of Issuance of Certificate and take a print out of the required form. Fill all the blanks in the application form of Issuance Certificate. Do not leave empty otherwise, your form will be rejected by the meeseva concerned officer. Submit your request application form to the meeseva center. From there MeeSeva center forward your application to the Nodal officer. The Nodal officer verifies application and forwards it to the CI officer. when the CI officer verifies then he forwards it to the SHO officer. And after verifying request further forward it again to the CI officer. And then the CI officer forwards it to the Nadal officer. After receiving application form CI officer, Nadal officer forward it to the SDPO for further verification. And when the SDPO verified, forward it to the SHO. When he verify the application and document then he sends the approval/rejection status of the application to the SDPO and the SDPO sent the status report to the Nodal officer. After this Nodal officer sends the application/request status to the meeseva and meeseva sent the status report or certificate to the applicant.